Click on the ones with ** to see my reviews. I’ve played with this list off and on for some time, and finally gave up on it at 21 books for the challenge because I always think I can get through more books than I can. I have two reviews forthcoming, but for all intents and purposes, I’ve finished the challenge. Out of only 18 entrants, the lucky winner picked by Randomizer.org is #9, Marvin D. Wilson! Congrats to Marvin. All those extra entries have paid off for you. I wanted to share with you my list and which books I’ve already read! (Those will have **) Click on the ones with ** to see my reviews. Check out the additions! I’m on a roll. Is it too early for a Fall Into Reading Update? I hope not. I wanted to share with you my list and which books I’ve already read! (Those will have **) Click on the ones with ** to see my reviews. Some of you may notice that some of the books have changed. I guess that’s because I have to prioritize my obligations. So I switched out a couple with some others…Can you guess which ones? 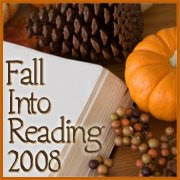 I normally don’t join challenges because they are time-consuming, but Fall Into Reading 2008 caught my eye. 1. Set reading goals for yourself and create a list of books to read this Fall. 2. All books are eligible and there is no limit to how many or how few you choose to read. 3. Leave a link to the post where you list your goals and books on Mr. Linky, here. 4. Check out the lists of other participants, write reviews of the books if you like, and commit to writing a wrap-up post in December. View the official ins and outs of the challenge at Callapidder Days. 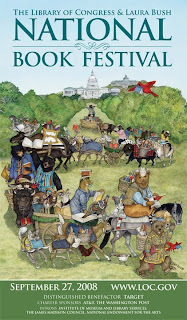 Just another reminder about the 2008 National Book Festival, feel free to check it out if you are in the neighborhood or the podcasts of the authors, here. Do you have little ones at home? Check out the Children’s toolkit. Here’s a list of the authors that are attending. Finally, a link to the Pavilions.